COLOR(S): White with tan, black or brown markings. Patches of color may appear on the main body, tail, and head. The Jack Russell Terrier is a small, compact agile, brave terrier, who is good at hunting small animals like foxes and raccoons. Like other terriers they may bore easily and are capable of inventing their own entertainment. Jack Russell Terriers are a tough little dog who is clean and a convenient size for a companion. These friendly dogs are bold, athletic and clever. They are game hunters, tenacious and courageous at work, and at home they are playful, exuberant and overwhelmingly affectionate. This breed is an independent and energetic terrier and requires their due portion of attention. The Jack Russell Terrier is a perky, happy, loyal, and loving dog. It is a friendly dog and generally kind to children who have been taught not to tease or strike the dog. Spirited and obedient, yet absolutely fearless. Careful and amusing, enjoying games and playing with toys. This breed is intelligent, yet willful and determined. They need a firm, experienced trainer. 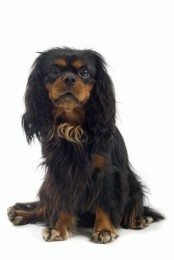 These dogs can be aggressive with other dogs if not well trained and socialized. They have strong hunting instincts (stronger than your average terrier) and should not be trusted with other small animals. They like to bark and dig. This is breed is not the breed for a inexperienced dog owner. This is a big dog in a little dog's body. The owner needs to be as strong-willed as they are, or this little guy will take over. With the right owner this little dog can really excel, but is not recommended for those who have not had prior experience with terriers. They have a smooth or rough and broken coat. All coat types are easy to groom. Comb and brush regularly with a firm bristle brush, and bathe only when necessary. To show, owners must strip the coat. Like the rough coat, the broken coated Jack needs to be stripped out also. Jack Russell Terrier can suffer from dislocated kneecaps (luxating patellas), eye problems, deafness, and Legg-Perthes disease, a disease of the hip joints. Jack Russell Terriers should receive daily exercise or outdoor activity. If not given consistent exercise, training, or a job to do, the Jack Russell can become destructive and edgy if confined. Early firm training is necessary to prevent a hyperactive dog. Will do okay in an apartment if exercised, but a house with a fenced backyard is better. Jack Russell Terriers can adapt to most living environments, provided there is a job to do, training or exercise is given. The best owner for this breed would be an active, terrier-experienced individual or family that are living in a suburban or rural environment.